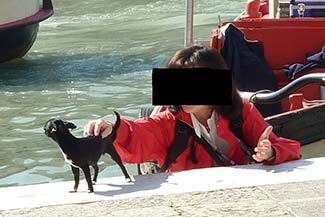 ABOVE: Puppy lover or dog snatcher? You be the judge. Mistake #9: Being careless with valuables. Violent crime is practically unknown in Venice, but--like many popular tourist destinations--the city is a magnet for pickpockets, purse thieves, and other crooks who prey on careless or inattentive visitors. Our niece lost her purse in the railroad station, and we know a travel writer whose video camera disappeared when she set down her tote to buy a gelato. At a language school that one of us attended last winter, three women in a class of a dozen students reported having their wallets lifted in Venice. Carrying wallets in hip pockets, where they're easy for a pickpocket to reach. Wearing purses over and behind the shoulder. Storing valuables in hip pouches or "fanny packs." Stuffing mobile phones, passports, and other valuables in backpacks. Carrying heavy camera bags (or, worse yet, obvious camera backpacks) that might as well be labeled "Steal me." Resting handbags on top of luggage while concentrating on a map or guidebook. Hanging purses from chair backs in cafés and restaurants. Wearing "neck wallets" outside clothing, in full view of thieves, instead of hidden inside a shirt or blouse. Use common sense, be aware of your possessions and surroundings, and read our "Crime in Europe" article before you leave home. Keep a small amount of cash, a credit card, and an ATM card in a thin wallet that you're carrying in a safe place (such as a zippered shirt security pocket). Store your passport and other valuables in a separate, hidden neck wallet. Carry photocopies of your passport, driver's license, and credit or debit cards in a separate location (e.g., with your companion) so you'll be able to report your losses and get replacements if the originals are lost or stolen. Next page: Mistake #10: Annoying the locals.